A ponderous collection by a Minnesota author (Going Nowhere, 1971, etc.) who seems to have mastered Poe’s voice without plumbing his depth. There appears to be a revival of interest in Gothic fiction these days, and not all of the blame can be laid at Anne Rice’s window lattice: New Age psychology, rock music, and a simple weariness with the vacuity of most literary fiction have all added fuel to the fire. While Greenburg is not Gothic (and certainly not “Goth”) in the strict sense of the word, he does seem to have an obsession of sorts with death. 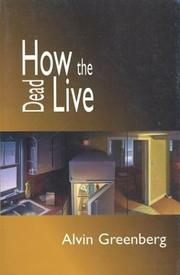 The title story, “How the Dead Live,” is a good example: its portrayal of a man’s encounter with a mugger turns into a classic memento mori when both thief and victim realize they—re dead: “Don’t mess with me, buddy. Never mess with a dead man. Dead men don’t have anything to lose.— Feidelman, the man in question, is dead because he hasn’t “anything to live for,” and this sense of despair is a common theme running through most of Greenburg’s 15 stories. “Gruber in Traffic,” for example, describes the midlife crisis of a 43-year-old Minnesota lawyer who becomes obsessed with his own death after seeing a vision of his rabbi staring at him in the midst of a traffic jam. “A Couple of Dead Men” describes the relations of two brothers who attempt to come together after one is diagnosed with terminal cancer. Spivak, the hero of “Immersion,” drives himself to the emergency room after getting hit by a UPS truck, and Elaine (“Crimes Against Humanity”) displays her increasingly suicidal desperation by obsessively asking people, “How much evil can a person do in a lifetime?” All in all, a morbid lot. Restrained prose and capable dialogue carry these pieces a fair distance, but the portentousness becomes too much after a while. Eventually, the stories seem as dead as their characters.